The Fellowship was fortunate enough to obtain a copy of THE RIDE: SOUTHERN GOTHIC #2 from 12-Gauge Comics. The anthology includes stories written by Ron Marz, Doug Wagner, Kody Chamberlain, and Tomm Coker. The art is by Chamberlain, Coker, Tom Raney, Andrew Robinson, and Toby Cypress. In “Paid in Full (pt. 2),” Jonathan goes to save Shelby as a debt payment to her boyfriend Danny, who happens to be the younger brother of a fellow special forces vet in Baghdad. But is he too late? What about the stolen car? In “My Brother’s Keeper,” Eli takes care of his brother Ephram ever since he came out of his cocaine induced coma. Someone has apparently given Ephram more. Eli wants to find out who and make them pay. In “Fully Loaded,” a TV actor is trying to keep one step ahead of a jealous husband and the local cops aren’t helping. A new set of wheels and a gun should be good protection, right? In “The Devil Don’t Sing No Blues,” a man discovers a bluesman that made a deal with the Devil for the gift of music. Throw in the Devil’s girlfriend and this bluesman may have gotten more than he bargained for. This issue has a nice mix of action, drama and crime (and a little supernatural) with a little Southern flavor. The art is all black and white which sets a nice mood for the stories. Would like to read more of these books. 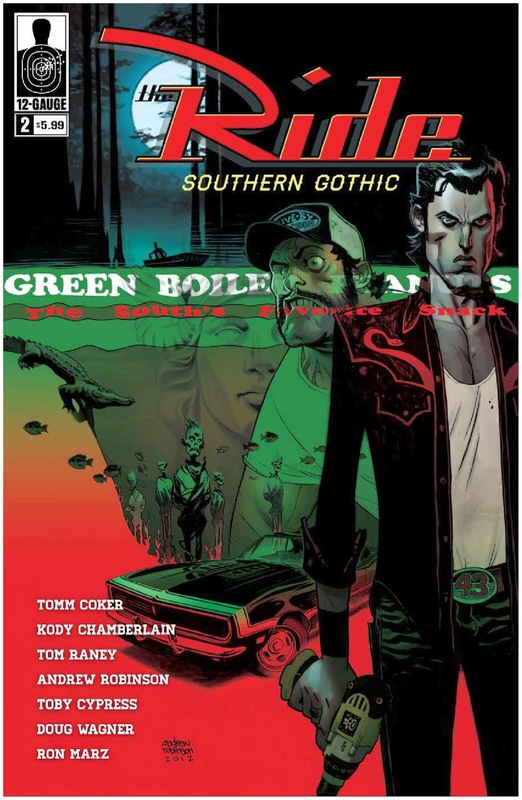 THE RIDE: SOUTHERN GOTHIC #2 is in stores now and available at www.12gaugecomics.com.